Well I did it - Page 4 - DAMN Riders - No rules, Just ride! wooot! woot! Momma went to the grocery store and as soon as she turned out of the driveway I dropped everything and went back to the shop. I put it in the mild mode and did a quick ride down the alley. Rides just like the EM Escape I demo'd but has a lot of noises I wasn't expecting. Tomorrow I'll recheck everything and make sure I didn't assemble something wrong. The one I rode was loud...well more noise than I expected. Looks pretty sweet (for a gay(nttiawwt) trials bike)! Pics of the matching spandex? does that include the limited edition trials mankini? I stopped by Ken’s earlier this evening. The EM is pretty cool. I rode it around the yard for 5 mins. It wheelies fairly easy in the “soft” map. Feels really nice doing tight turns/circles. I cant wait to test it more in the future. I'm also looking at a used 16 EM Sport. Hope its ok to post here. Found the DAMN board while searching for info and I'm local too (Silver Spring near Burtonsville). I'm torn between electric and gas. I want a trials bike to learn how to ride a dirt bike better and keep up w/ my buddies who've been doing it for years. I'm an avid mountain biker and am ashamed to admit I can ride way bigger stuff using pedals than I can w/ a motor:( I'm also an EE and did EV drives development for Hughes(GM) and GE(Ford) in the electric car infancy. So would love an electric bike but the one concern I have is the lack of clutch. Yes, the EM Sport has a clutch but I'm told its more of a kill switch than a featherable analog control? Will the lack of learning a clutch to do bigger moves be a hindrance? The benefits of electric are otherwise huge. My yard is only .38ac and could practice basics in the little backyard (or out back at work during lunch) vs having to drive ~2hrs to a track/trail somewhere that allows two strokes. That right there is REALLY appealing if its not a huge detriment to transferring the skills to a gasser. Ken, I now see you JUST took delivery. Any gut feel yet as to how much it will help riding something like your KTM or it is just too early? Clearly you thought the tradeoff was worth it. Mind sharing what convinced you to get an EM? I'm sure you had a lot of the same questions. The electrics are very cool. My son is on his second OSET (google it if you’ve never heard of it). The OSET 20.0 is still small but big enough that I can ride it. My wife is 5’3” and works fairly well for her. Anyway, we all the ride the electric bike in our stupid HOA neighborhood. A normal gas bike would have people freaking out at us. But the stealth factor of the electric dirtbikes cant be overstated. Even with the lack of a clutch, I think the Ebikes are still an awesome tool. Not worry about clutch or gear and concentrate on balance, body position, throttle/brake control. Especially when you will ride SO much more when you can just on and practice in your neighborhood every day/week. Learning trials, regardless of the trials bike, will definitely improve your offroad riding skills. The little I did a few years ago definitely helped. I'm expecting more improvement as I learn and get more experience. 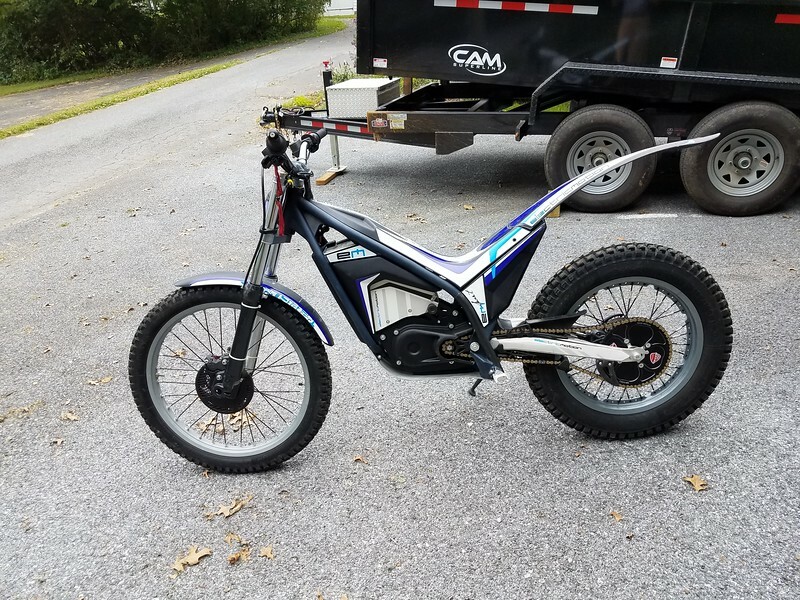 Regarding the EM, I wanted something that I could ride in my backyard and not disturb the neighbors plus I'm fascinated by electric motorcycles. I love the convenience and simplicity of the bike. Virtually no maintenance - just ride it! BTW, after the first of the month, come up to my new place and try it. 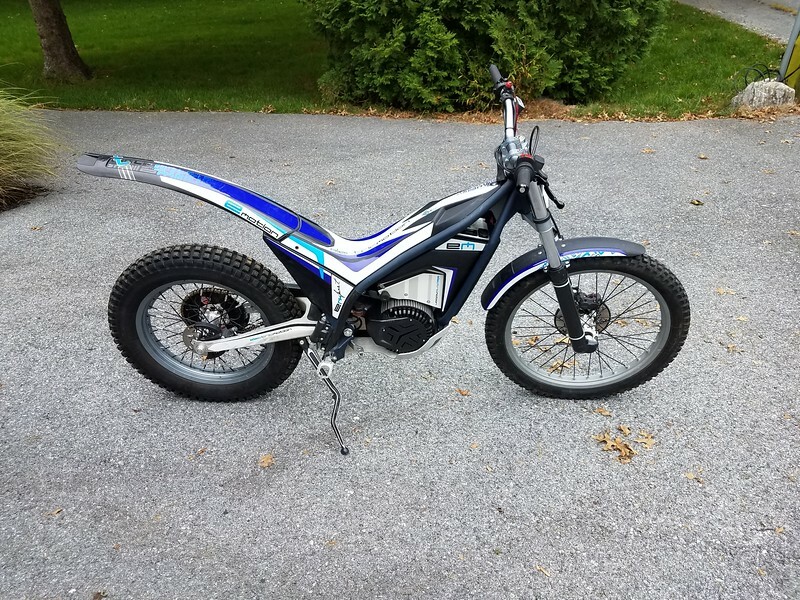 if you go to ADV Rider in the trials forum you will find some posts about the other electric trials bikes. Yamaha has a full clutch with gears..if we get it to the US who knows. Dale, ex GasGas trials importer is also importing electric trials bikes and full clutch. The EM will perform just fine as long as ridden old school with more roll up attack but with full clutch and gears then zaps and splatters are possible.